FULTON – Every year the Rotary District Governor makes an official visit to each of their nearly 50 clubs in Central New York. 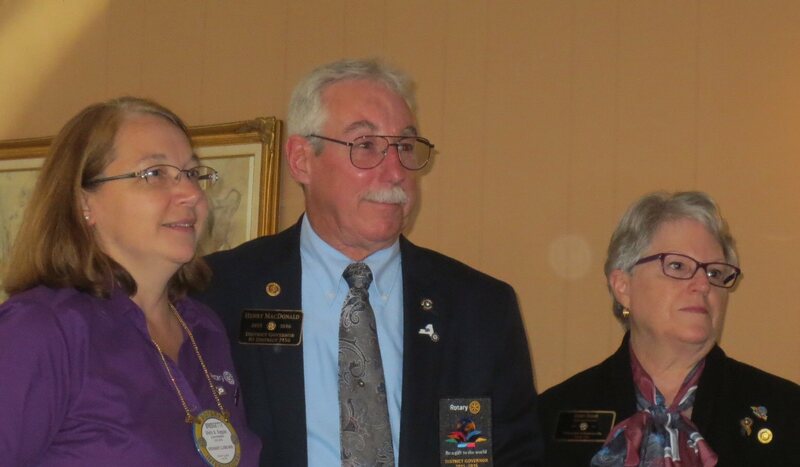 District Governor Henry “Mac” MacDonald is welcomed by President Bridgette Seguin, left, and Assistant Governor, Jenny Doane, right. Recently, District Governor Henry “Mac” MacDonald, made his official visit to the Fulton Noon Rotary Club. Greeting the District Governor was the Fulton Club President, Bridgette Seguin and Assistant Governor, Jenny Doanet. The Governor is a member of the Auburn Rotary Club and the Assistant Governor is a member of the Baldwinsville Rotary Club. The Fulton Rotary Club, which meets Thursday noon at the Tavern on the Lock, reviewed their international and community service projects that have been planned and completed this Rotary year. DG Mac gave the Rotarians a very inspirational talk on Rotary.